Sometimes you not only want to make a lot of waffles, but you want to make a lot of waffles in style. Well, the Krups 4 slice Belgian waffle maker is here to help you do just that. With a few extra bells and whistles, this Krups waffle maker wants to be in your kitchen for life. Watch the movie, read the review, and find out if the Krups Belgian waffle iron is for you! The Krups Belgian waffle maker is a pretty big kitchen appliance but in order to make 4 waffles, you need a decent sized waffle maker, right? This machine has nice, big waffle iron plates that are non stick, have a deep Belgian waffle grid and are also removable for easy clean up (nothing like being able to stick the waffle iron plates straight into the dishwasher while you enjoy your breakfast!). There are a few extra features on this Krups waffle maker such as the temperature control and the indicator light which beeps when the waffle maker has heated up. These little add-ons are nice to have, and they make this waffle iron stand out over its peers. At around $35, you will be getting a user friendly machine for a great price! To put the Krups 4 slice Belgian Waffle Maker to the test, I whipped up a batch of our amazing waffle batter and plugged the waffle maker in. I set the temperature dial to 3 which would be medium heat. I figured that testing the waffle maker on medium is a good place to start; not too hot but hopefully hot enough to make some nice golden brown waffles! After about 5 minutes, the waffle maker beeped fairly loudly to indicate that it was hot and ready to go (I honestly thought my smoke alarm was going off- the beeping surprised me!). I can see how this would be a nice feature if you are getting ready in the morning and still trying to make waffles – you’ll know exactly when the Krups waffle maker is ready for you! After 5 minutes the waffles were a nice light golden brown. The waffles popped right out of the waffle maker and did not stick at all. When I cut into the waffles, they were crispy enough but the paler sections were slightly soft. I think that turning the heat up to 4 or 5 would be a good idea for the next batch as I like a good crispy waffle! While the waffle maker was not necessarily dirty, no batter stuck to the plates or dripped out of the machine, the plates were very easy to remove. As the Krups waffle maker plates are dishwasher safe, if the Belgian waffle plates had been dirty, they would have been very easy to clean! Great price for its feature set! I Say Yes to the Krups Waffle Maker! Overall, I was pretty impressed by the Krups 4 slice Belgian Waffle Maker. While I do think it was a little heavy and bulky compared to other machines, it did a great job making 4 Belgian waffles quickly. Having features like the temperature dial is really nice and give you more control over how your waffles are cooked. For those of us who aren’t big fans of cleaning, removable plates are a dream! If you are looking for a machine that can make you a lot of waffles in a little amount of time for a great price, then look no further- the Krups 4 slice Belgian Waffle Maker is it! 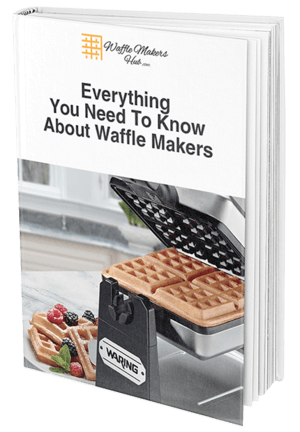 If you thing you may want something different like a flip waffle maker or a double waffle maker instead, check out our Ultimate Guide to the best waffle makers or our other reviews. You are sure to find your perfect machine on Waffle Makers Hub!